Ever since the industry of online casinos came into being, Visa credit and debit cards are already used by players to deposit and withdraw money in their gaming account. Until now, it is still one of the payment methods supported by numerous online casinos, allowing players to manage their bankroll with ease and security. Fund your account with your Visa card! Among the payment options available at LuckyLive Casino is Visa cards. Players are able to fund their account or get their payouts using this method promptly and hassle-free. There’s no need for them to make an additional account which is required for e-wallet services. They can simply use their existing Visa account information to get started and enjoy an array of live dealer and virtual games for real money. Usually, players worry about using LuckyLive Casino Visa since it requires them to provide personal and financial information. Of course, it is normal for them to be cautious since there are already numerous cases of frauds, identity thefts, and others in some online casinos. However, there’s nothing to fret about since aside from the security measures provided by the Visa Company, LuckyLive Casino runs cutting-edge 128-bit SSL encryption technology to protect their players’ credentials. First: The deposit will appear as a purchase on the player’s credit card account, so the description “MC VUETEC” will be seen. Second: All the transactions are made in EUROS. 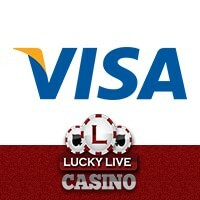 Also, making a transaction using the LuckyLive Casino Visa is free. The online casino does not charge processing fees; hence, players are able to maximise their money. What’s even better is that making a deposit or withdrawal using this mode of payment is plain and simple. Players just have to go to the ‘Cashier’ and choose between Deposit and Withdrawal options. Once done, select ‘Visa’ as the payment option and fill out the form provided with the necessary details. After, the transaction will be processed and players can expect to enjoy their money in no time.